Another week, another 5 inspiring outdoor spaces coming up. 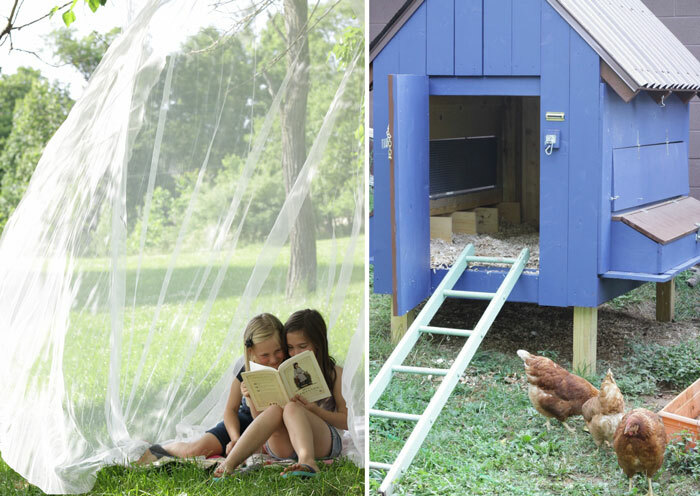 Today we are swinging by Primitive + Proper country backyard complete with veggie gardens and chicken coop. She has chickens, people! Chickens! Something this city girl is super enamored and frightened of at the same time. I love it! When Stefanie invited me to participate in her Beautiful Backyard series, I was thrilled, but also a little nervous. After all, our backyard is not like the rest of our outdoor spaces which display a bit more of our style. In the front yard we have curb appeal and a flower garden and fire pit. We have a wraparound porch that serves as our family hangout and place to relax and read, or sip coffee or wine. But our backyard? Well to be quite honest, it's not what I would call beautiful, unless your idea of beauty is in functionality. Our backyard is all about serving our family needs, and making use of our land. We were thrilled to move out to the country 5 years ago and gain much more land in that move. We have almost 2 acres, and we are doing our best to make use while teaching our children important life skills. Way back behind our garage and up on a hill was a grassy open area. We've turned that into our vegetable garden and plan to extend it next year, and add rows of cutting flowers to attract more bees and fill our vases. Directly behind our house we've fenced in a large area, initially for our old beagle who is no longer with us. Our current 3 dogs would much rather be anywhere we are than out roaming, so while the fence isn't needed for them as much, it has recently come in handy as we've added a chicken coop; our hens are able to free range in our fenced in back yard. With my father's help, my husband and I built the coop ourselves over several weekends. We were so excited to finally put it to use and more recently gather our first eggs! A friend suggested a shelter in the middle of the yard to protect the hens even more (we have several trees for protection) from hawks. My kids had also been asking for a trampoline, so I thought I'd kill two birds (this pun seems oh so wrong here!) with one stone; our new trampoline has the kids jumping for joy, and the hens safely under shelter. Our backyard is by no means a well designed or manicured space, but it is a reflection of our happy and beautiful life. Anyone else craving a fresh egg omelette right about now? Never mind that, head over to Primitive + Proper to see more of this free range loveliness. And in case you missed it, here is a round up of the outdoor spaces shared last week. thank you so much for including me in this series- i have loved seeing everyone's outdoor spaces!